Water is the essence of life dominating the chemical composition of all organisms. Serving as the fulcrum of biochemical metabolism, aqueous media are the most efficient means of nutrient delivery. Results RNA? Intra-oral Sprays deliver plasma-based nutrients across a broad surface of the oral mucosa, which are then immediately absorbed and carried directly into the living cells. We call this delivery system Plasma to Plasma. The percentage of usable micronutrients made available to the body by Results RNA? 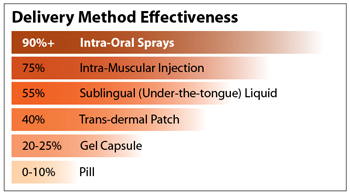 Intra-oral Sprays is much higher than capsules, pills or dermal transfer methods as depicted in the chart below. Results RNA? Intra-Oral Sprays deliver close to 100% of the usable nutrients directly into the target cells within seconds.